I’ve had it up to my eyeballs with pale rosé. In these latter days of summer, my preferred potion is not blush in color, nor the electric orange of an Aperol spritz. It’s a gleaming shade of ruby, and served in a condensation-covered glass. Yes: chilled red wine. 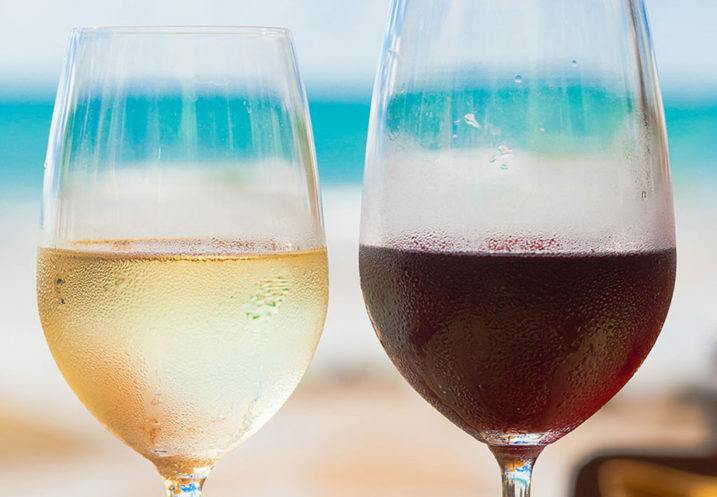 The habit of serving white and rosé straight from the fridge and red at room temperature is hard to break, but it ignores many of wine’s nuances that go beyond color. For a long time, the easiest (and sometimes only) way to order a cold glass of red at a restaurant was to seek out Gamays—lively and light-bodied reds, often from the Beaujolais region of France. But now, a wide variety of chilled reds that are fun, food-friendly, and easy to swill are appearing on more restaurants’ wine lists and shopkeepers’ shelves. Many of the best bottles come from natural wine-makers, whose slow, low-intervention fermentation processes often result in wines that are high in aromatics, but low in tannins—a crucial quality, since chilling will make any wine taste more tannic, or textured. If you see a wine described as glou glou—the French term for the “glug-glug” sound of gulping an easy-drinking wine—there’s a good chance you’re in the company of a chilled red.